Aloha Means "Good-bye" to Boredom and "Hello" to Flavor! In Hawaii, the word “Aloha” has many different meanings -- love, affection, peace, compassion, and mercy. That’s why it’s the perfect thing to say to just about anyone in any situation. The beauty and wonder of the aloha spirit was the inspiration behind the colorful, tropical peppers we introduced last year that are now back in supermarkets throughout the country! With beautiful stripes of red and yellow, SUNSET®’s new Aloha™ peppers are as colorful as they are flavorful and add a twist of the tropics to any of your favorite pepper recipes. They’re perfect for stuffing, great for grilling and are sure to capture the interest of picky kids and fussy foodies alike. They’re a beautiful addition to your next salad and a healthy, colorful snack when sliced. Ready to turn your dinner table into a tropical paradise of mouth-watering flavors? 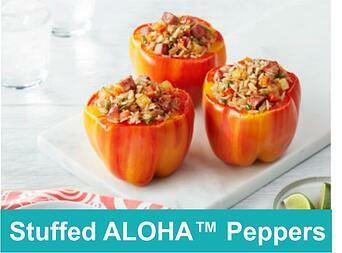 Our chef inspired Aloha™ Pepper Pork and Stuffed Aloha™ Peppers will have you begging for seconds. Each dish boasts a medley of sweet and savory flavors that’ll have you cranking some island reggae for your dinner tunes. And just as the word aloha can mean hello or goodbye, we think you’ll find that our Aloha peppers have similar appeal in all your favorite dishes! 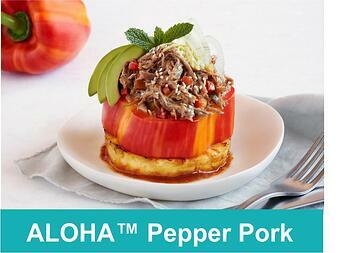 Check out Celebrity Chef Roger Mooking’s Aloha™ Pepper Pork in this easy to follow video. So grab a grass skirt and start cookin’!